Vietnam was Audley’s first destination, and our passion for the country remains strong, with our specialists continuing to seek out the best accommodation, guides and excursions to ensure your trip creates life-long memories. Our itinerary ideas include both the country's main cities and sights as well as less visited places such as central Vietnam, the idyllic islands of Phu Quoc or Con Dao, bustling markets, colourful hill tribes and incredible scenery. Use these travel suggestions as a starting point as you plan your holiday and we can then tailor each one to your own interests and preferences. These itineraries are designed to give you some suggestions for what is possible when you travel in Vietnam, and they showcase some of the routes that we’ve found work particularly well. Treat them simply as inspiration, because your trip will be created uniquely for you by one of our specialists based on your particular tastes and interests. Drift among stunning limestone karst scenery on a traditional junk in Lan Ha Bay (a quieter alternative to Halong). Unearth Vietnam's modern and ancient history in imperial Hue. Shop and relax in charming Hoi An. Experience the well preserved shop houses and cobbled streets of Hoi An. Travel along the Ho Chi Minh Trail. Visit the traditional 'Rong' houses of Kon Tum. Observe the faded colonial grandeur of Dalat. Take in Saigon after dark on a unique Vespa tour. Spend a few days navigating the mesmerising city of Saigon. Explore the kingdom of coconuts, Ben Tre. Enjoy two nights at a charming riverside lodge in Vinh Long province. Discover the hidden charm and culture of one of the few remaining Khmer communities in Vietnam. End the trip in Cambodia's capital city, Phnom Penh. Cruise through the lush Mekong Delta region and visit the floating markets. Watch the sunrise stream through the giant creeper fig trees at Ta Prohm. Soak up the atmosphere of Saigon. Learn about Cambodia's modern and ancient history in Phnom Penh. Take in the stunning Tonkinese Alps with light treks around the mountain town of Sapa. Stay overnight in the world's third largest known cave, Hang En in Phong Nha-Ke Bang National Park. Drive through Mu Cang Chai, one of the most beautiful road journeys in Asia. Visit the Rhododendron Falls in Bach Ma National Park. Spend time in the UNESCO protected towns of Hue and Hoi An. Take time to explore the capital of Vietnam. Enjoy exploring Mai Chau by bike. Head out on a river safari in Nam Et-Phou National Park. Trek amongst beautiful scenery in Nong Khiaw. Relax in tranquil Luang Prabang. Immerse yourself in hill tribe culture unique to this region. Trek through rice terraces to remote villages inaccessible by road. Spend time exploring the colonial Old Quarter in Hanoi. Admire the stunning mountain scenery. Experience time in the capital Hanoi, and the vibrant city of Saigon. Take a seaplane and explore the waters of Halong Bay by air. Visit the UNESCO protected monuments of Hue and the preserved heritage of Hoi An. Relax on the beaches of Phu Quoc. Enjoy eight days exploring the mighty Mekong aboard the beautiful RV Mekong. Explore the Cambodian capital Phnom Penh. Spend two days discovering the incredible temples of Angkor. Begin your trip in Hong Kong where east meets west. Explore the charming Vietnamese capital Hanoi where the organised chaos is perfectly contrasted by the serene temples and beautiful lakes. Embark on a river cruising adventure through lesser visited parts of Northern Vietnam. Visit the hill tribes in the spectacular Mai Chau Valley. Sail on the UNESCO World Heritage Site, Halong Bay. Explore the colourful hill-tribes of the Tonkinese Alps. Drift among stunning limestone karst scenery on a traditional junk on Halong Bay. Witness typical Vietnamese scenes whilst cruising through the Mekong Delta. Learn the secrets of Vietnamese cuisine with a series of cooking classes, street food tours and market exploration. Sample some delicious food at local haunts away from the usual tourist options. Discover regional specialities ranging from earthy ethnic Thai cuisine to Hoi An's famed White Rose dumplings. Explore the charming streets of Hoi An's UNESCO recognised Old Town. Stray off the beaten track and visit a Co Tu village. Visit Rhododendron Falls in Bach Ma National Park. Relax on the idyllic beach of Lang Co.
Kayak through stunning limestone karst scenery at Halong Bay. Take time out to enjoy rural life in Ky Son. Try out a martial arts lesson in Hue. Enjoy a fishing trip in Hoi An, before a barbecue lunch on board the boat. Shop and relaxing on the beach at charming Hoi An. Scramble through the fascinating Cu Chi Tunnels near Saigon. 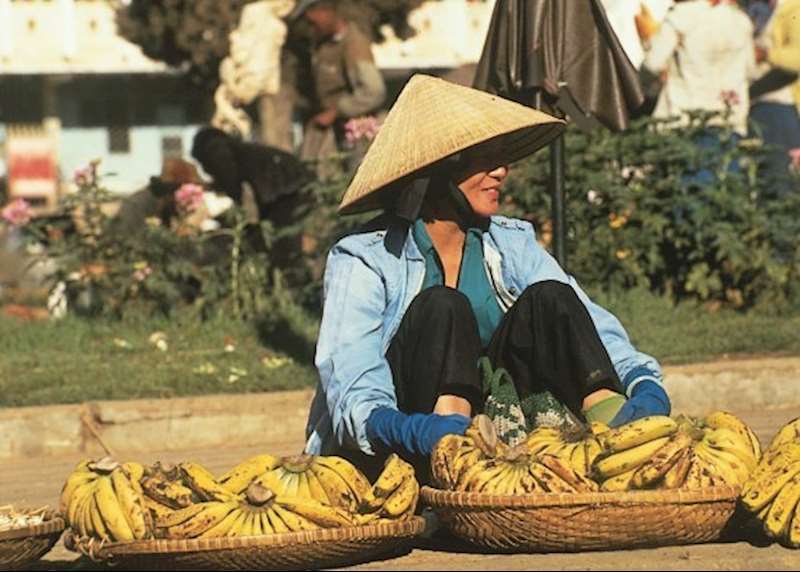 Experience the full flavour of life surrounding the Mekong in Indochina. Visit the UNESCO World Heritage Sites of Luang Prabang, Vat Phou and Angkor Wat. Enjoy river cruising in Laos and Vietnam. Explore the vibrant cities of Phnom Penh and Saigon. Explore the frenetic Vietnamese capital and sample some of the country's best loved street food. Journey through the rarely visited and strikingly beautiful Ha Giang region of Vietnam. Here you will explore the history and culture of the Dao and Hmong minority people. Trek your way through Hoang Su Phi and Sapa as well as taking a cable car to the highest point in Indochina - Mount Fansipan. Wander through the old battlefields of Dien Bien Phu and learn about Vietnam's greatest ever military victory. In Laos you will take one of the most rewarding river journeys in the region followed by some time in remote Phongsali. End with some luxury at Muang La Lodge and some time in UNESCO recognised Luang Prabang. Take in five of Indochina's UNESCO World Heritage Sites. Soak up the charming atmosphere of Luang Prabang. Gain a new wardrobe in Hoi An with a visit to a tailor. Learn about Cambodia's modern history in Phnom Penh. Marvel at the scale and majesty of the temples of Angkor. Discover buddhist culture in Luang Prabang. Spend a night on a traditional junk cruising among the limestone scenery of Halong Bay. Explore the fascinating towns of Hoi An and Hue. Barter at the bustling markets in the Mekong Delta. Explore the incredible Temples of Angkor. These trip ideas, from our Hidden Beaches collection, are our answer if you’re looking to relax but still want to explore. Each itinerary combines time at one of our hand-picked beach properties with a few days spent either on safari, taking in a city, discovering the local culture or hopping to the next beach. These itineraries are just suggestions, and a specialist will plan your holiday individually. Explore Saigon and the Mekong Delta before relaxing on a beautiful beach in a secluded location in Central Vietnam. 3 nights Saigon including breakfast & excursions, 7 nights Angsana Lang Co including breakfast. Includes flights and transfers. Discover the colonial heritage and Chinese, Indian and Malay influences on cosmopolitan Singapore before heading to central Vietnam to relax in a pool villa enjoying complimentary spa treatments. 3 nights Singapore, including breakfast; 7 nights Fusion Maia, including breakfast and 2 daily spa treatments. Includes flights and transfers. Discover one of Asia's most thrilling, spectacular and cosmopolitan cities, Hong Kong before enjoying beach time near to the UNESCO World Heritage town of Hoi An. 3 nights Hong Kong, including breakfast; 7 nights Four Seasons Resort The Nam Hai, including breakfast. Includes flights and transfers. Explore the fascinating temples of historic Angkor before a relaxing week at the beach on Phu Quoc Island. 3 nights Siem Reap, including breakfast and excursions; 7 nights La Veranda Resort, including breakfast. Includes flights and transfers. Explore Vietnam's capital city before relaxing at the stunning Six Senses property in Ninh Van Bay. 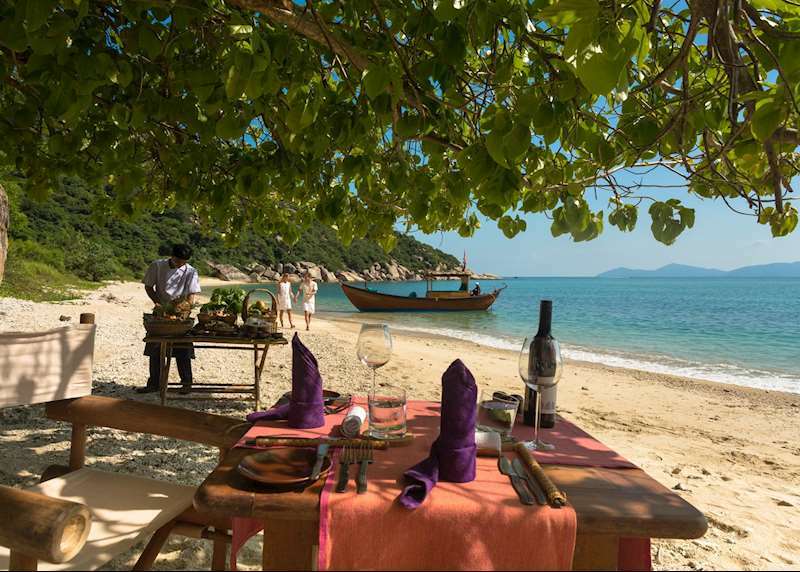 3 nights Hanoi, including breakfast and excursions; 7 nights Six Senses Ninh Van Bay, including breakfast. Includes flights and transfers. As a year-round destination you won't have to worry about taking the kids out of school to visit Vietnam. It's mostly malaria free and there are lots of activities on offer for all the family. You'll also be greeted with a warm welcome from the Vietnamese themselves. 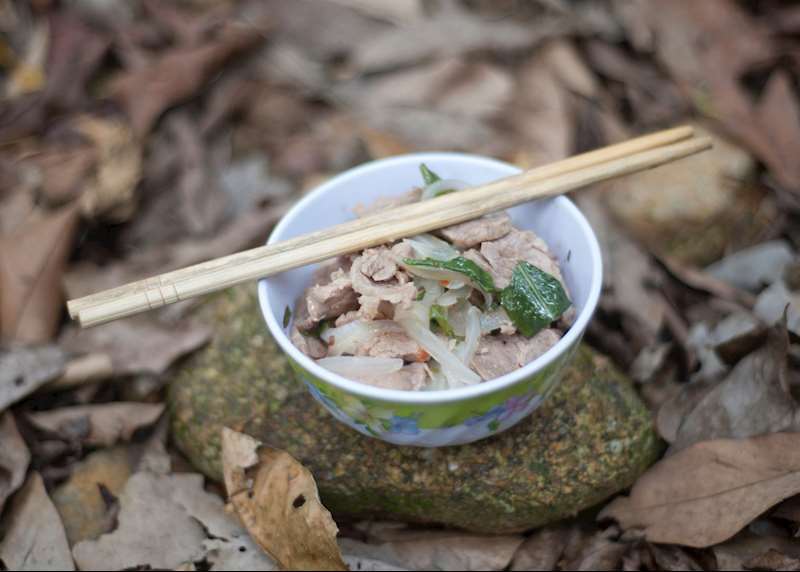 Vietnam’s cuisine varies from being more salty in the north to spicier in the south. Country Specialist, Lauren, selects some of her top dishes and where to try them such as Vietnam’s national dish pho, bun cha in Hanoi and cau lau noodles in Hoi An. Vietnam’s Phong Nha region is a honeycomb of record-breaking-size caverns, cathedral-like grottoes and subterrane rivers. Indochina specialist Georgia hones in on the best ways to explore the caves, from leisurely cruises to multi-day jungle treks. Our guide will help immerse you in the sights, people and landscapes of Vietnam. Whether you plan to visit a floating market on the Mekong Delta, sample street food in Hanoi or explore Saigon at night on a vespa. 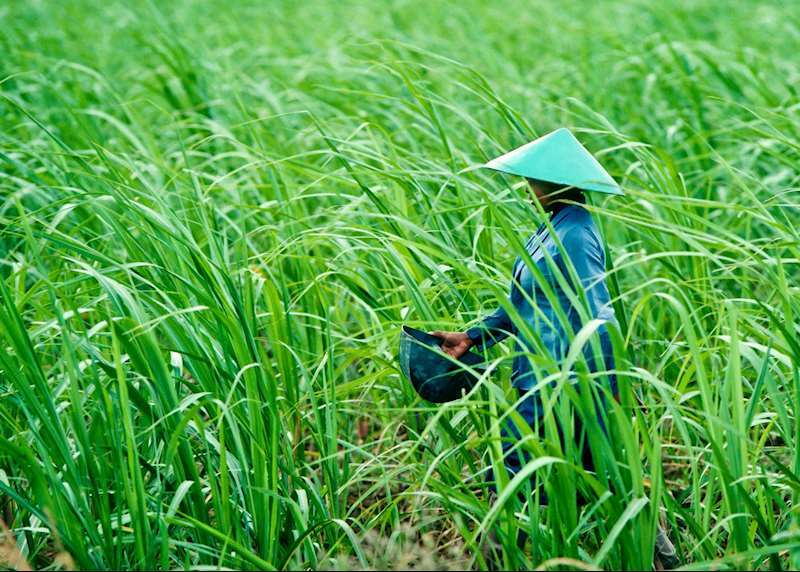 When our Southeast Asia Regional Sales Manager visited Vietnam he discovered a hidden side of the country, working with the locals planting rice and exploring a secret weapons house used during the Vietnam War. Vietnam is home to a range of properties that you can include in your luxury holiday. From boutique hotels with their French colonial architecture, to desert island hideaways only accessible by boat. 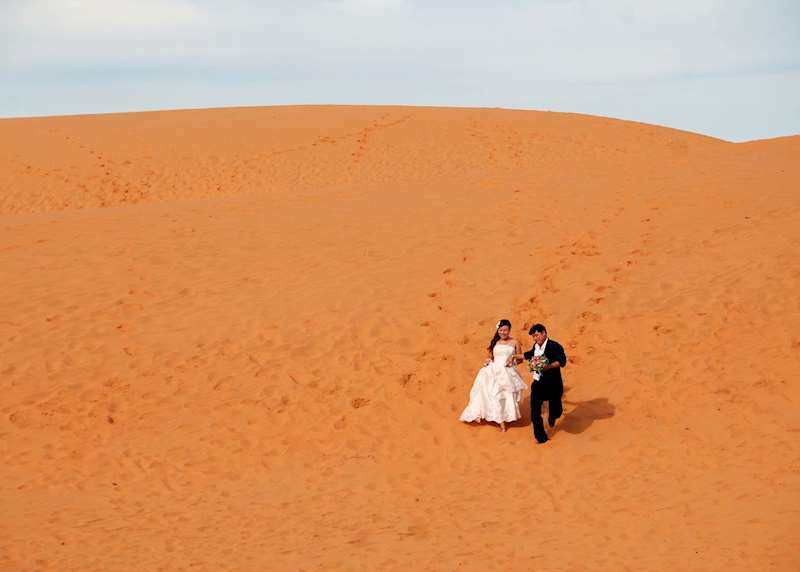 Bounded by the warm South China Sea, Vietnam’s sandy beaches are equal to any in the region. Add to this a range of sophisticated beach resorts and the scene is set for a quiet break in understated comfort. Vietnam specialist Mark picks his best of the bunch. The mighty Mekong River, fascinating hill tribes of the north, the epic scenery in Halong Bay... these are just a few of the reasons our country specialists recommend a honeymoon in Vietnam. Plan your perfect trip with us. Indochina specialist Georgina shares her suggestions for how to experience Vietnam’s regal city, Hue. Where to sample the freshest spring rolls, how to get hands-on in one of the many art studios, and which historical sites to visit to unearth Hue’s place in Vietnam’s imperialism and modern wars. There’s so much to the Mekong Delta, you could spend an entire trip exploring it, trying everything from cycle tours to sampan cruises. Craig from our Vietnam team has curated a tour through the region based on his own experience.